Workaholics need to consider the time involved in being a pet parent. If you want a dog, think carefully about the life adjustments you’ll need to make. There are a number of things to consider long before adopting a dog as a pet. Pets are meant to be a permanent addition to your home. Too many owners with good intentions give up their dogs to shelters every year — an unfair and sad outcome for any pet. Owning a dog is a lifelong commitment, so think carefully if you only have a limited amount of time to devote to your new dog. Workaholics are up early and often home late, so they must be realistic about pet time. Depending on the size and the temperament of the dog you choose, proper indoor and outdoor spaces for sleeping and exercise may include fenced and sheltered areas. The smartest and most easily trainable dogs don’t always make the ideal pet. Your job is to find a breed that suits your lifestyle and spend enough time with your dog to bring out his best. If you live alone, care is all up to you. Many unmarried pet “parents” find that hiring a dog walker or taking their dog to pet daycare is a great way to be sure their pet gets adequate exercise and socialization during the long days when they are away. Intelligent and eager to please, retrievers need exercise and space. Because of their mild dispositions, these gentle dogs normally adapt to your schedule, but will need plenty of attention and outdoor play time when you come home. Not the smartest breed, this dog may take take some time to learn commands. But the bassett has an easy-going nature and will likely be content to snooze away chunks of time when left on its own. Like all dogs, a regular schedule of walks and exercise is needed by a bassett. These pint-sized cuties can be paper-trained if you can’t make it home to let them out on a regular basis, and are usually happy to perch near a window and watch the world go by. They have bursts of high energy, but are small enough to run around easily in a more confined area. 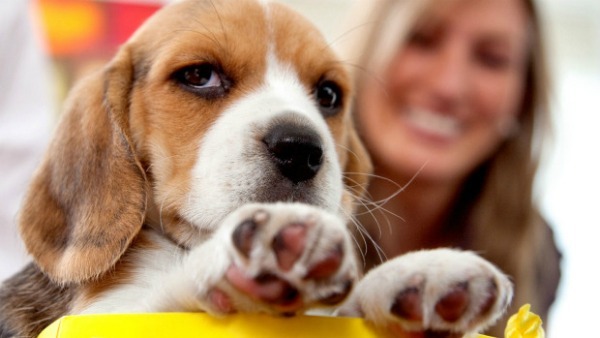 Playful and devoted, the beagle is a good family dog. Walks are important to this curious breed, and the beagle can be very social with children and other dogs. This is a happy, alert breed that isn’t shy or aggressive. Papillons normally are content to “go with the flow” and will adjust to your comings and goings, being very loving when you are with them. Their diminutive size — about 10 inches high — means its outdoor space can be small. Every dog deserves a certain amount of owner attention. When considering a pet dog, workaholics should put the animal’s basic needs at the top of the list: good food and fresh water daily, exercise (a minimum of two walks/romps every day), health care and vaccinations, grooming and comfortable sleep spaces. Your dog is entitled to lots of attention when you’re at home, and a safe and secure place to stay when you’re not. And in your absence, dogs can sometimes be naughty or have accidents. Your dog needs a home where forgiveness for these incidents is a given.